She's half woman, half amazing. However, she still endures some of the same struggles we all go through. It's been 11-months since Serena Williams gave birth to her daughter Alexis Olympia Ohanian Jr., and she admits, it hasn't been easy. 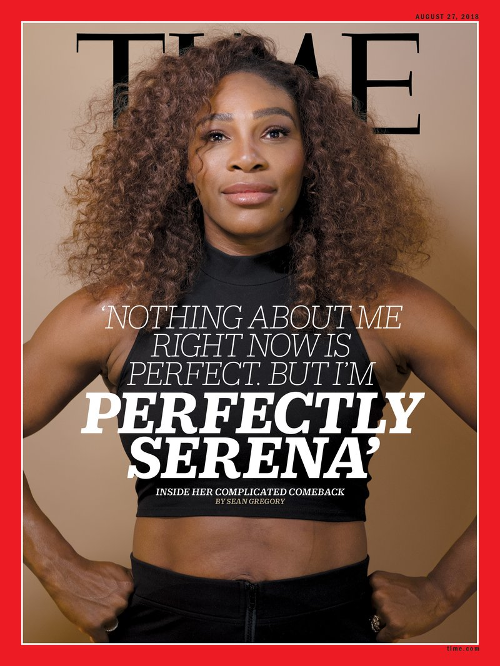 The tennis superstar, above rocking her Serena threads on the cover of TIME magazine, wants to dominate the court AND be a good mother to her baby. So, if she's having such a hard time, why still play tennis? Why not just focus on being a mother? The 23-time Grand Slam title winner wants to beat Margaret Court's record of 24-Grand Slam titles. And she's clearly on a mission. The 36-year-old tennis star said she breastfed Olympia for the first eights month, even though she feels like it made it harder for her to whip back into shape. Her tennis coach, Patrick Mouratoglou, encouraged her to stop breastfeeding to help improve her game, but she wasn't about to take advice from a man who just doesn't understand the importance of breastfeeding. Good for her! We're sure having mom, sister, cousins, family and a doting husband around are helpful as well. You can read her full interview here, where she also talked how she feels about the man who fatally shot her sister getting released on parole, her marriage to Reddit co-founder Alexis Ohanaian and more. Since dishing about Beyonce Bitegate, Tiffany Haddish has been labeled as a celeb who talks TOO much. Which is odd, because a lot of times people complain about celebs NOT telling enough. Hey, they can't make everyone happy. In the new September 2018 issue of VOGUE magazine, the Girls Trip star (who looks BOMB, by the way) admits that she sometimes adds fluff to stories for comedic value. Like that story she told about Drake standing her up for a date. It wasn't actually a date, date...more like a group outing. Be sure to catch Tiffany starring opposite Kevin Hart in their upcoming comedy film Night School when it hits theaters September 28th. NEXT: LET THEM KNOW! John David Washington Said Put Some RESPECT On Mom Pauletta Washington's Name!